Troops of a British infantry battalion in Salonika. Serbia: Austrian 62nd Division cross river Drina from Bosnia, causing mass civilian exodus towards Novipazar. 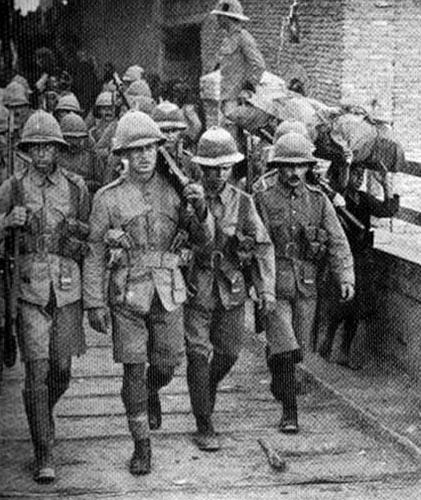 Salonika: British troops authorized to leave and to help French. Baltic Provinces: Russian landing party repulses Germans near Dömesnes (western headland Gulf of Riga). West Cameroons: c. 400 British take Bamenda and road junction south of Chang (October 24). Half of the Bamenda captors beat 100 Germans near Bagam on October 27. Black Sea: Russian Fleet bombards Varna (repeated on October 27). Austria: CoS Conrad memo to Emperor hopes Serbia’s defeat may lead to peace.